Are you feeling suicidal or self-harming, or have you lost someone to suicide? We’re here to help. Working with Pieta House, we are providing a free crisis counselling service in Dublin city centre. Our therapist, Nash, is friendly and welcoming, and will listen to you in a safe, non-judgemental space and work through whatever is worrying you. 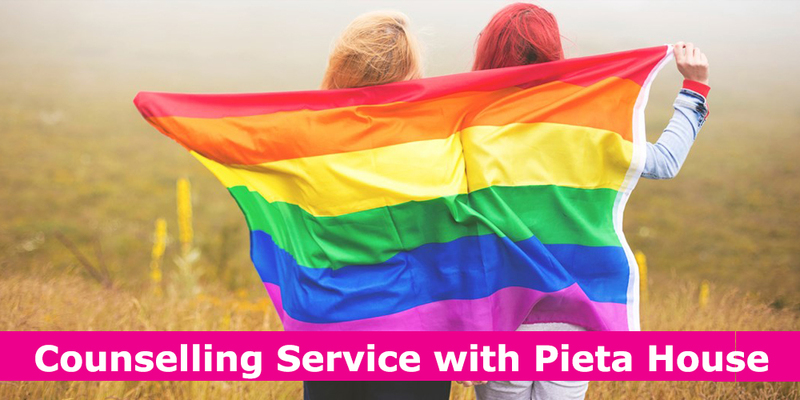 This service is available free of charge to LGBT+ young people aged 14-23, and the sessions take place in BeLonG To on Parliament Street, Dublin 2. What does ‘suicidal’ mean? What is self-harm? Suicidal ideation, or suicidal thoughts, can vary from fleeting thoughts of ‘not wanting to be here’ or feeling that ‘the world/people I love would be better off without me’, to feelings of worthlessness, a preoccupation with dying, or persistent thoughts of suicide. Self-harm is when you deliberately cause physical harm to yourself as a way to cope with difficult or pent-up emotions. It is usually done in secret, and can take lots of different forms, from cutting or burning yourself, to punching, biting, or hair-pulling. Our counsellor Nash will be able to teach you other ways to cope with your feelings. You will be chatting to Nash. She is a qualified accredited Psychotherapist with over 10 years of experience in working with young people at risk. You can talk about anything from self-harm, to school, to coming out. Nash may ask you a few questions like ‘how you are feeling?’ to help understand better what you are going through. Each session lasts for 50 minutes and the treatment lasts up to 12 sessions. Yes, whatever you say in the session will be between you and Nash. We only need to share information or take action if you ask us to; if we believe your life or someone else’s life is in danger; or if you are being hurt by someone in a position of trust like a teacher or parent. The sessions take place every Tuesday and Wednesday between 9am and 1pm. The sessions take place on the first floor of the BeLonG To offices (13 Parliament Street, Dublin 2). To access the building, you buzz the door and then walk to the second floor. There is a waiting room where you can relax, have a glass of water, and read a magazine before your session. Nash will come and get you when it is time for you to come in. To make an appointment, call Pieta House Dublin South (01 462 4792) or send an email to belongto@pieta.ie. Let them know you would like to meet with Nash for counselling at BeLonG To and they will find a time that works for you to come in for your first session.